Developed an info resource on Lunar New Year in partnership with the West Van Memorial Library, North Van City Library, and North Van District Library. Hosted Acting Against Racism: Strategies for Moving Forward. September 14, 2017 – An anti racism forum with over 400 participants hosted at the Kay Meek Centre. See complete details here. Hosted conversations across the North Shore as a part of the Inclusive Inquiry Community Conversations. Read more about the findings of our community conversations here. the diversity that exists on the North Shore. The posters were displayed in community spaces on the North Shorethrough BC Multiculturalism Week. See them all here. November 19, 2016 – The North Shore community was invited for an evening of story and music at Presentation House Theatre. 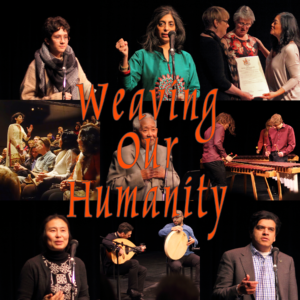 We had 3 community storytellers, 2 musical performances, a keynote speaker and a spoken word artist create a warm welcoming space for the last day of BC Multiculturalism Week. Attendees heard about belonging and missed connection, vulnerability and courage. They also heard about what friendship and humanity across cultures means in our diverse community. Read the final poem written during the event here. See news coverage of it here.The event was a partnership between NSIIP, the North Shore Multicultural Society, and Presentation House Theatre. Weaving Our Humanity was the final event in a series of community conversations that was held on the North Shore as part of NSIIP’s Inclusive Inquiry Project. in the City of North Vancouver speak non-official languages most often at home.